One never knows what kind of healthy food will be found when traveling for work. 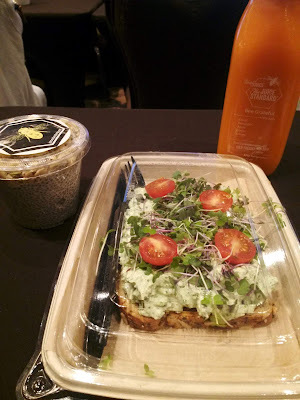 At a recent conference at the Cosmopolitan in Las Vegas, I was in search of something more Whole Foods Plant Based than the conference's breakfast buffet had to offer. Enter The Juice Standard. I found salad toast, chia seed pudding, and some fresh juice. Crazy good. I've been making chia seed pudding for a few years now, and everyone has had freshly juiced juice concoctions, but salad toast is new to me. And it BLEW MY MIND. This one was a chunky cucumber tzatziki with cherry tomatoes and micro greens. Ya eat it with a knife and fork. And it ties right in with the motto I adopted after becoming a nutritionist - "put a salad on it".